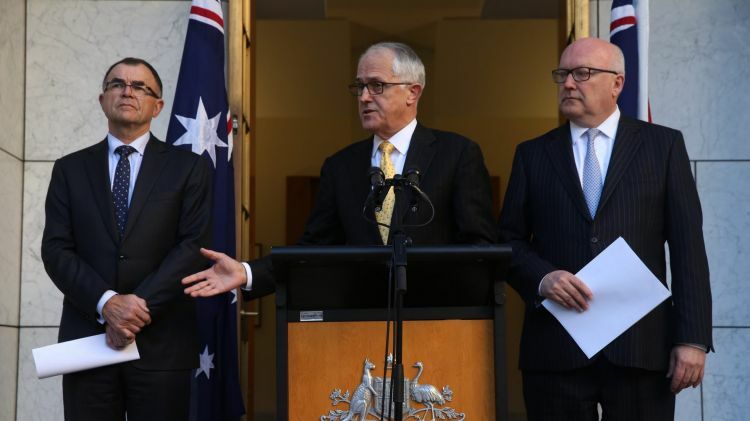 HomeRoyal Commission, Rudd: How could Malcolm Turnbull get it so wrong? Another fine offering from the excellent Urban Wronski – as always, my thanks. It all looked fabulous for five minutes, just like the PM himself. No-one knows what went wrong. Perhaps Malco the human calculator did not count on the ways ascendant luminaries which include Zed Selesja and climate change sceptic Matt Canavan can bugger up an otherwise flawless decision making routine – especially when they interact with the likes of Peter Dutton. Welcome to inertia and policy paralysis where the right defies anyone to do anything worth doing. And it’s groundhog day on the environment. Turnbull’s cabinet preserves the undistinguished Minister for Aboriginal Affairs National MP Nigel, “pique my interest”, Scullion and puts “Mr Coal”, Josh Frydenberg, in charge of both energy and environment – despite advice that at least one of these ministers could be better suited elsewhere. Instead Turnbull has created an over-sized, unwieldy cabinet by adding a few right wingers to some proven underperformers featuring a Treasurer who now wants to “double down” on the benefits of free trade when all around the world the benefits are being exposed as a hoax. And recycled failures. Just how many times will Pyne be given another chance to stuff up? The unhappy little Vegemite was making a stand. The minister said he was tired of hearing about “people’s rights”, and wanted people to think more about alcohol-fuelled domestic violence and child neglect. And to notice him. 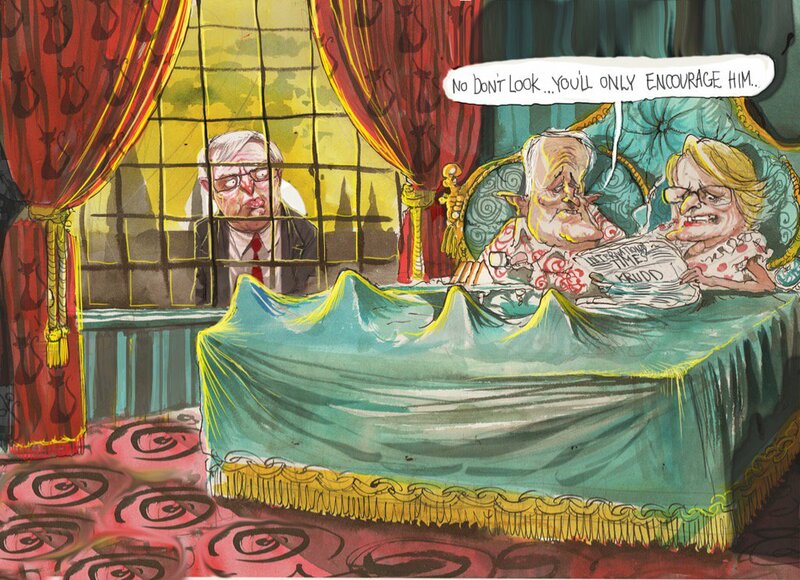 Now Turnbull’s made a dud captain’s call in not backing Rudd’s bid for the UN; he’s insulted indigenous Australia by failing to consult with the Aboriginal community over his NT-friendly Royal Commission – and, above all – he’s agreed to keep the coalition agreement with the Nationals secret. Welcome to open transparent and consultative government from the only party with a plan. And a mob of diabolical liabilities in cabinet. Well, most of the results are in for the two-party preferred vote for the election. And it looks like the final total will be around 50.35/49.65% to the Coalition. With that in mind, the final result seems to be moderately fair. The Coalition got around 100,000 votes more than Labor in 2pp, so that seems to have translated to a majority in the lower house. However, Labor did quite well in its marginal seat campaign. A look on the ABC pre-election calculator says that a 2PP of 50.4/49.6 would have resulted in the coalition getting 81 seats while Labor only got 64. So that’s not too bad there. 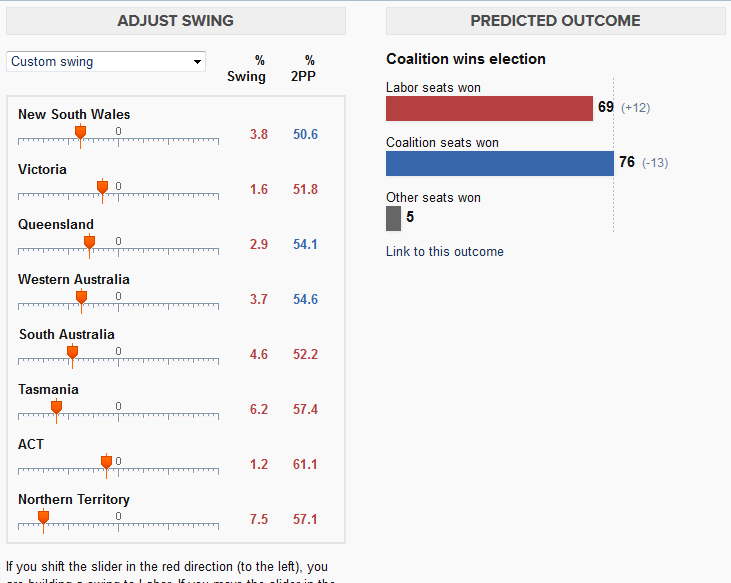 As for the state-based margins, however, the ABC calculator seems to be pretty much spot-on. The individual seats that changed were off (like Queensland resulted in Herbert and Longman being gained instead of Petrie and Capricornia), and the result in Mayo required an override, but, it got the numbers right by the look of it. I guess in the end Labor got the best results from the numbers that it was given. The Guthrie broom at work. We can’t have any of that pesky proof of the Libs’ lies. and I immediately thought of this – very apt for a PM who is a dead duck. This is so funny. You should send it to Murpharoo. Fancy describing Turnbull as a dancer. What next? That was my other option. Truffles more an aficionado of this sort of dance…………. It might be a bit too complicated for Fizza. Is Lynne Cosgrove really Hyacinth? Oh Lord! 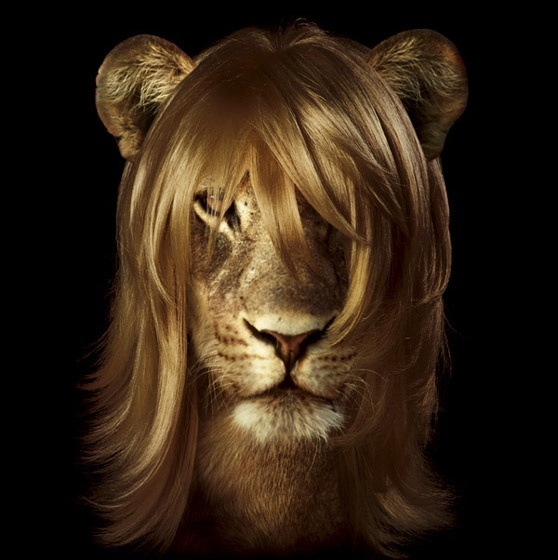 I’m going to have to change my hairstyle. It’s just like Hyacinth’s. At least your voice bears no resemblance to Hyacinth’s! But back in the day it was more ? Actually, it was, sort of. I wonder why he doesn’t want to be associated with “sovereign citizens”? Sovereign Citizens? What next ffs? I think every one is politicked out. All i know is I am sick of numpties and spics rinning the country and states like NSW. It is time for one big royal commission into our political class, financial services and media to find the who and why of how we ended up being governed by people you would not put jn charge of cleaning a cow’s stall. Lots of fun and games ahead. Especially when we have a pm who respects Pawleene. It’s going to be laugh a minute with these One Nation senators. Now they are trying to claim all the credit for a RC into banks, if that ever happens, because it was allegedly their idea in the first place. Even sillier – it’s Mr ‘I’m about to go before the courts on a charge of theft’ Culleton doing all the claiming. It will be a very cold day in hell before the major parties allow One Nation to dictate terms of reference for anything. Well, they haven’t even started yey but I am so sick of the olympic games, I think it is time they were stopped. Every four years a city somewhere in the world spends untold billions on sporting facilities, useless roads going to these same facilities only, housing for spoilt and ungrateful athletes that do nothing productive for the country that is spending these untold billions on them. Then these same spoilt and indulged superstars of sports complain about the facilities, find inane reasons for their lack of success demanding respect and second, third and forth opportunities to laud it over the rest of the public while attending their second, third, fourth, etc olympic games. Meanwhile the population of these cities are responsible of paying back these untold billions in costs of these unwanted, unused and later abandoned sporting facilities, infrastructure and buildings that they were shunted out of their homes to provide for these spoilt, indulgent and ungrateful athletes. So the populace that have no choice in getting the olympic games see their city destroyed, see their taxes and costs increase, are kicked from their homes, can’t even go to the games because they cannot afford tickets to them, are told that they should be greatful these spoilt, indulgent and ungrateful athletes came to their city and spent their time cocooned inside (and complaining about) the facilities that the citizens will be paying off for generations while their hospitals, schools, employment, utilities are cut back. No wonder the people are rioting, they have been kicked out of their homes, their electricity, gas and water has been cut off so it can be diverted to the olympic facilities, schools have been shut because money ran out, hospitals and clinics have closed through lack of funds, roads have been built dividing communities and stopping people fron getting to where they used to work. public transport has been stopped or diverted to service the olympic facilities and to top it all off if they complain riot police are sent to brutalise them. All for a few thousand spoilt and indulged athletes and their hangers-on who have never lacked for anything, spent their whole lives on the tax-payers teat demanding more and more, these same spoilt and indulged athletes who will leave that city in a couple of weeks leaving it bankrupt with the poor and disadvantaged left to pick up the bills for the athletes two weeks of poncing around demanding everything, and getting it. Time the olympics was cancelled, time Australia stopped spending $200million each year on these spoilt leaners and time the poor stopped being the bunnies that picked up the bill for it all. I for one have no interest or intention of watching any of the olympic games and hope that there are millions more that take the same stance. If we don’t watch, the tv channels will not want to pay to broadcast and we won’t have to listen to the schmaltz and jingoism that masquerades as commentary, the advertisers will not want to sponsor them and cities will not want to go into debt for generations to pay for something no one watches and maybe these spoilt and indulgent superstars of society will get off their collective arses, find a job and stop leaching off the rest of us thereby freeing up a couple of hundred million in Australia that can be spent on those that need it and freeing up billions worldwide for the more needy. Excellent rant, I totally agree. Is there any particular reason why Malcolm Roberts is turning up everywhere?? He’s on Lateline now. If there was ever a politician they should be talking about rather than talking to, it’s him. Comments here will close very soon.